It is sad how they are obliterating Bose and Patel from the cumulative conscience of the upcoming generations by selectively deifying certain individuals. Very true ! Worthy names are intentionally being omitted and opportunists of the pasts are kept alive just to seek momentary benefits ! History is not what we were taught in our textbooks.Its hidden in the writings of the authors of those times and the daily journals which not everyone would bother to follow.Alas,the facts is the unsung heroes may become unheard as well. I fully agree with your reply to Umashankar. There is so much in our history that our life is short to read & learn from all of them. And thanks for sharing this. I thought the tallest statue is in Puducherry. Ooops I just posted a comment, can’t see it here now. wish i could 🙁 how does it matter anyways ? 🙂 Nisha would remain Nisha ain’t it ? mere pass Nano hey worlds smallest car 😀 😛 say NaMo !!! 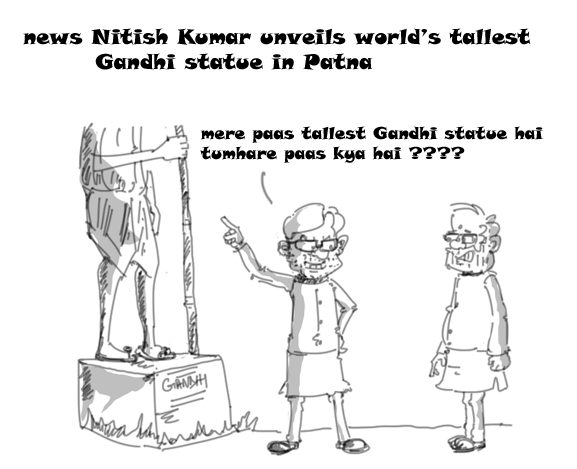 Ha ha ha….This is really funny, loved Nitish’s Kumar expression!